The DataCal Sesotho sa Leboa language keyboard labels are a high-quality, durable and economical solution to creating an Sesotho sa Leboa bilingual keyboard. The Sesotho sa Leboa keyboard labelsare the same as the English (US) keyboard layout. The labels are printed onclear Lexan® so the original key legend shows through; this allows you to add Sesotho sa Leboalabels to your existing keyboard so that it becomes a bilingual keyboard (Sesotho sa Leboaand the original language of your keyboard). The labels are available in blueletters on clear labels (for beige and light colored keyboards) and whiteletters on clear labels (for dark colored keyboards). 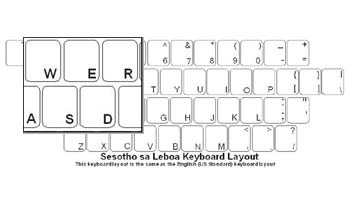 The Sesotho sa Leboa keyboardlayout, it is supported in all English (US) versions of Windows. This label supports keyboard layouts for Afrikaans, Australia, Belize, Canada, Caribbean, Chinese Macau, Hausa (Nigeria), Igbo (Nigeria), Indonesian, Jamaica, Malaysia, Maori, New Zealand, Northern Sotho, Philippines, Sesotho sa Leboa (South Africa), Setswana (South Africa), Singapore, South Africa, Swahili, Trinidad, Tswana, United States, Uzbek (Latin), Xhosa (IsiXhosa), Yoruba (Nigeria), Zimbabwe, and Zulu (IsiZulu). Sesotho sa Leboa labels are a veryeconomical option for creating a bilingual Sesotho sa Leboa keyboard. Thelanguage labels use an easy peel-and-stick method to install. They will not damage the original keyboard key. The letters are printedon the underside of the labels so that the lettering will not wear out. Thisaffords you with many years of durable use. DataCallanguage labels are designed to fit desktop and laptop computer keyboards.Laptops with smaller than standard keys may not be compatible with the DataCallabel sets. You must first configure Windows for the international language that you wish to use. After you configure Windows, you will be able to manually select the international language when you wish to use it. For additional information on language setup, see the Windows Help file system of contact Microsoft technical support.